A five channel power amplifier with output capability to drive any home theatre speaker system to realistic levels. 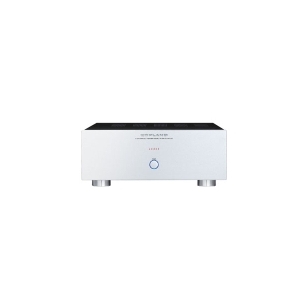 The amplifier retained its stylish exterior with emphasis on build quality, efficient airflow and temperature control. A single chassis employs five independent amplifier modules, each with its own rectifiers, filtering and regulation, etc. By keeping the entire channel on a single circuit board, the length of the pcp tracks and wiring for signal and high current distribution are kept to an absolute minimum for accurate dynamics and spatial image. The CVA 535 has a built-in softstart circuit for prolonged reliability with the added safeguard of DC and thermal protection for extra assurance. All channels accept single ended as well as balanced inputs and the standby switch can be controlled from either the COPLAND CTA 306 pre-amplifier or the system remote control. SPECIFICATIONS Rated power 125 W / channel at 8 ohms T.H.D. Less than 0,05% at all levels Frequency response 20-20 kHz - 0,2dB Input sensitivity 1,4V for rated power Input impedance 100 K ohms (single ended inputs) 12 K ohms (balanced inputs) S/N ratio ( IHF-A curve ) More than 103 dB Power consumption 1300 W Nominal mains voltage 115V or 230V factory set for destination country only Mains voltage range +/- 12% Dimensions 430 (W) 168 (H) 420 (D) mm. Weight 30 kg.